This week saw the first fleet of laptops powered by AMD's sixth-generation A-Series processor go on sale, with new models from HP and Dell set to be joined by ones from Lenovo, Asus and Toshiba in the coming months. They all have one thing in common: AMD's Carrizo APU. A system-on-chip for notebooks that squeezes in more transistors but consumes less power than its predecessor, the "Kaveri" APU, Carrizo is finding a home in notebooks costing between $400 (around £256) and $700 (around £448) - a price bracket the company believes has been left out in the cold. "The systems that have been available are lacking in features and capabilities," Kevin Lensing, corporate vice president and general manager of AMD's Client Business, tells TechRadar. He claims that while most are up to the task of surfing the internet, checking email and listening to music, they're not so good at streaming HD (and higher quality) video, content creation and gaming. To convince users that mid-range laptops can still do magic, AMD has built Carrizo around three main pillars consisting of improved battery life (particularly when streaming video), gaming (with a focus on eSports), and general performance. AMD wants Carrizo-powered laptops to allow people to do a bit of everything, and while they won't offer the gaming prowess or battery life of some high-end notebooks, the company is confident they can take on models packing Intel's i5 and i7 processors in certain areas. Due to Carrizo remaining on the 28nm fabrication process, it was necessary for AMD to innovate. Without the luxury of a die shrink and its associated power savings (Intel's Skylake processor, for example, is now manufactured on a 14nm process), the company approached its design from a different angle. 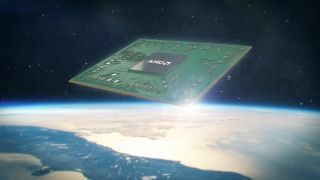 AMD integrated what used to be known as the Southbridge onto the processor for the first time to create a System on Chip (SoC) that's fully HSA 1.0 compliant. This allows systems to share data between the CPU and GPU more efficiently, removing the need for data to written to one before being being copied to the other. The result is that applications work more efficiently, and power savings can be made through finely tuned power management of the compute and graphics cores in the processor. Further efficiency gains were achieved by moving to a high-density library (HDL) design for Carrizo, allowing AMD to squeeze 29% more transistors into almost the same die area as Kaveri. "The use of HDL is much closer to how we design GPUs than a traditional CPU library and drastically reduces the power of the CPU processor cores," says Lensing. "Those transistors were used to integrate the Southbridge and deliver a complete system-on-chip, double the number of video compression engines and introduce an all new HEVC decoder." Introducing the HEVC (High Efficiency Video Encoding)/H.265 compression standards allowed for smoother and more energy-efficient playback of HD and Ultra HD video content, whether locally or streaming. This resulted in up to a 50% reduction in file size compared to the current H.264 industry standard. Reducing the burden on the hardware allows the APU to play 4K and FHD content at a smooth 60 fps. "You could stream equal quality video with dramatic reductions in the bandwidth required and power consumed, so you can watch up to two times as many videos on a single battery charge," says Lensing. "Alternatively, you can use that bandwidth to increase the amount of information you are streaming, thus enabling 4K or Ultra HD streaming". HEVC is supported by Amazon, Microsoft and Netflix, whereas Google has integrated its own open source VP9 standard into the Chrome browser and YouTube. In Windows 10, any application the decodes HEVC content through the Windows decoder will be accelerated, allowing for full frame playback and enabling optimal battery life. This includes video chat apps, transcoding apps, media players, in addition to Modern Apps found in the Windows store. On Carrizo helping Microsoft's Xbox One stream games to Windows 10, Lensing says: "HEVC decoding provides additional processing capabilities for AMD sixth-generation platforms to playback different Xbox One streaming formats." AMD also has its own apps, including Gesture Control and Looking Glass, which Lensing bills the "first consumer visual search application for video". "Think about it as a sort of Google Desktop for video – you select a face you want to search for and it will identify and list all movies and videos with that face in them," he says. "It provides significant performance advantages versus competitive offerings because it uses a hardware decoder, CPU and GPU acceleration, and a hardware encoder." Gesture control, meanwhile, promises to let you control apps and interact with the operating system using facial recognition and hand movements on inexpensive laptops that feature Carrizo APUs inside. Carrizo is designed for gaming with Windows 10 and DirectX 12. AMD claims it can provide up to 2x the performance of Intel's Core i5-5200 and Core i7-5500u (with Intel HD 5500 graphics) when used in dual graphics mode. Asymmetric rendering (offloading some processing duties to the integrated GPU) helps in this area, but - as with Intel's integrated graphics - the biggest gain has come from AMD allocating a huge amount of the Carrizo die area to the GPU. AMD is targeting the eSports crowd here, particularly those who play games such as Starcraft 2, GOTA online and League of Legends (LOL) and may not want to splash out for a high-end laptop with dedicated graphics. With Windows 10 now downloading onto machines and Direct X12 games coming later in the year, AMD is pushing Carrizo's full feature set which includes Mantle, and Vulcan-ready API support, in addition to AMD Catalyst Driver Support. The end result could be noticeable gains in frame rate in 15W TDP notebooks (35W ones are available too) compared to AMD's previous generation APUs, without sacrificing battery life and minimising heat and noise. Ultimately, there are two aspects to Carrizo. The first is that it's an APU for those who don't want to be tied down to a single activity on a computer. You might want to do a bit of video streaming, followed by some light gaming and then some media editing. Considering the tasks that users will be looking to do on laptops in this price bracket, making the APU a capable all-rounder seems like a smart move. The second part to Carrizo is how AMD has managed to up compute efficiency while lowering power consumption while remaining on the 28nm process. The improvements mark the beginning of the company's plans to make a x25 improvement in the energy efficiency of its APUs by 2020 that, if achieved, could them an exciting prospect indeed. For now, the new Carrizo laptops on the market hold plenty of promise and could prove do the job for a wide range of users. We'll find out for ourselves by bringing reviews of upcoming Carrizo notebooks to these pages soon.